Figure 1. 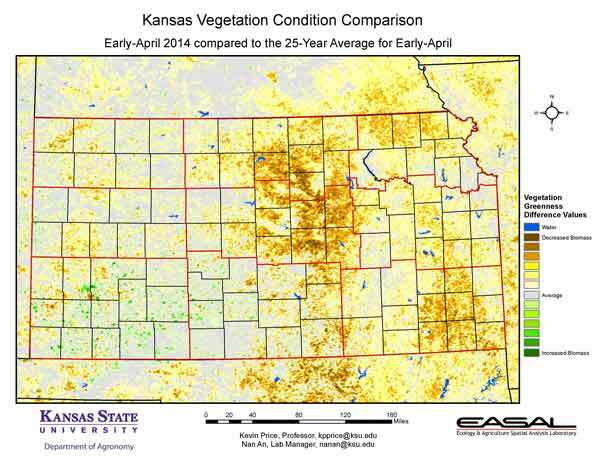 The Vegetation Condition Report for Kansas for April 1 – 14 from K-State’s Ecology and Agriculture Spatial Analysis Laboratory shows that vegetative activity is greatest in the South Central Division, where slightly warmer temperatures have resulted in further progress in the winter wheat. Low vegetative activity is particularly noticeable in parts of western Kansas, especially in the area from Wallace to Trego counties and in Hamilton County. This is due to a combination of dry conditions and the cooler temperatures. Figure 2. 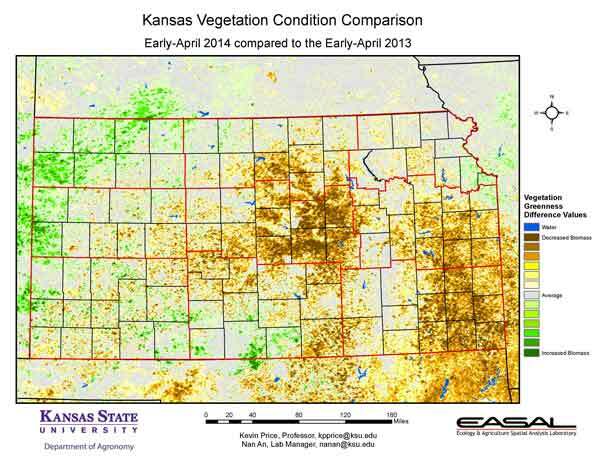 Compared to the previous year at this time for Kansas, the current Vegetation Condition Report for April 1 – 14 from K-State’s Ecology and Agriculture Spatial Analysis Laboratory shows the greatest decrease in vegetative activity in the Central, East Central, and Southeastern Divisions. 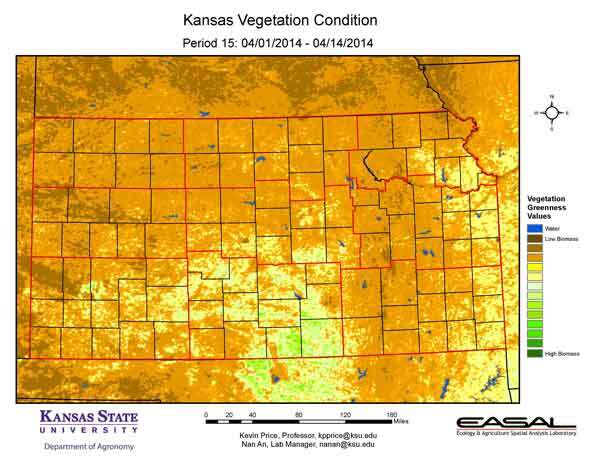 Northwest and west central Kansas have increased vegetative activity. For the west, this does not signal excessive plant activity; it is simply the fact that vegetative activity last year was extremely limited. Figure 3. 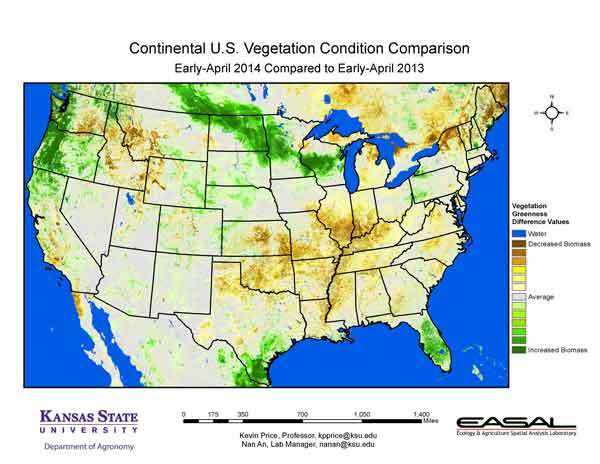 Compared to the 25-year average at this time for Kansas, this year’s Vegetation Condition Report for April 1 – 14 from K-State’s Ecology and Agriculture Spatial Analysis Laboratory shows the biggest area of below-average vegetative activity is in the North Central and Central Divisions. In North central Kansas, cooler temperatures have delayed plant development. In the Central Division, the cooler temperatures are compounded with extremely dry conditions. Figure 4. 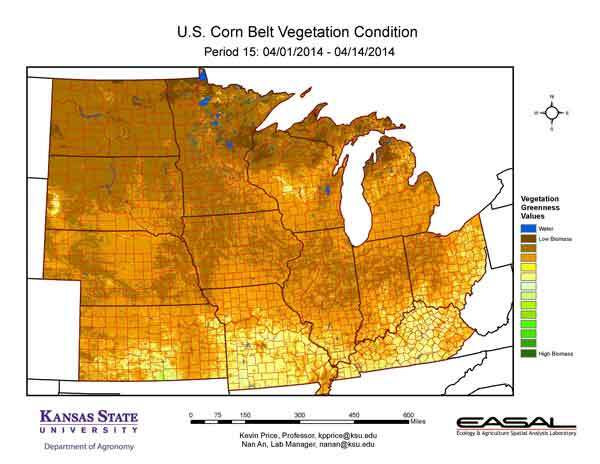 The Vegetation Condition Report for the Corn Belt for April 1 – 14 from K-State’s Ecology and Agriculture Spatial Analysis Laboratory shows that the area of lowest vegetative activity is slowly moving northward, as the snow pack retreats. Cold temperatures have delayed field activities in the northern areas of the Corn Belt. Figure 5. 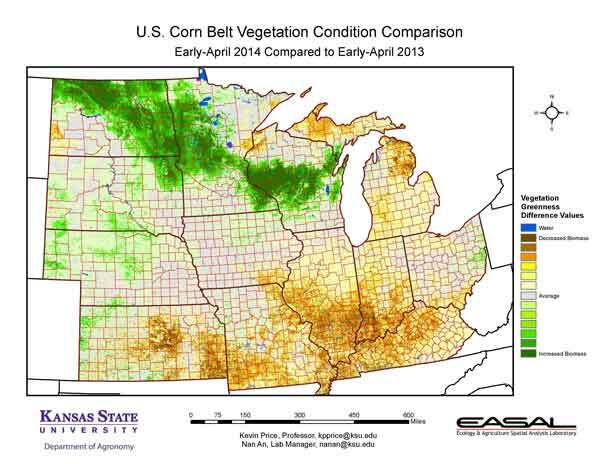 The comparison to last year in the Corn Belt for the period April 1 – 14 from K-State’s Ecology and Agriculture Spatial Analysis Laboratory shows much greater vegetative activity in parts of North Dakota, Minnesota, and Wisconsin. This is due mainly to the lower snow pack this year. In contrast, lower NDVI values are seen in the southern areas of region, due mainly to cooler-than-average temperatures. Figure 6. 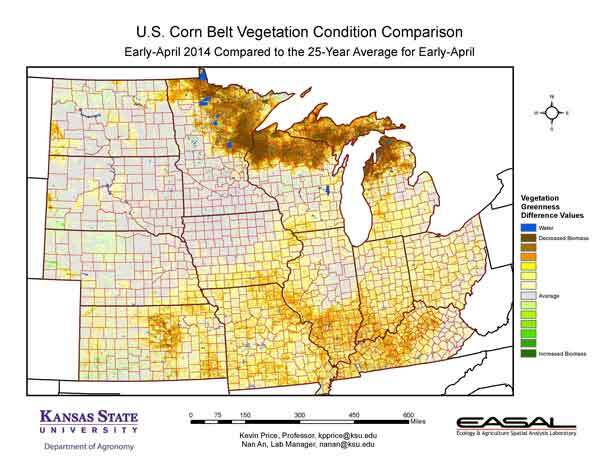 Compared to the 25-year average at this time for the Corn Belt, this year’s Vegetation Condition Report for April 1 – 14 from K-State’s Ecology and Agriculture Spatial Analysis Laboratory shows that the greatest departure is along the northern Great Lakes, where lingering snow cover continues to delay development. Slighter decreases are seen in the southern portions of the region, where cooler air temperatures are the major influence. Impacts from the freezing temperatures during the April 13-15th period won’t be visible for several weeks. Figure 7. 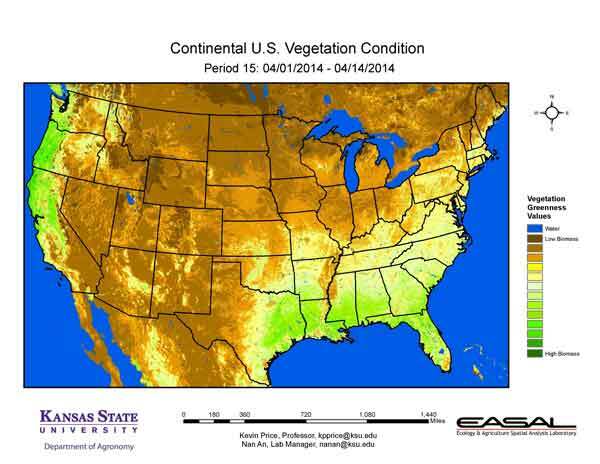 The Vegetation Condition Report for the U.S. for April 1 – 14 from K-State’s Ecology and Agriculture Spatial Analysis Laboratory shows that the greatest vegetative activity is along the Gulf Coast and the Pacific Northwest. For the Gulf Coast, the combination of favorable temperatures and moisture has fueled plant development. Along the Pacific Northwest, especially into northern California, the lack of snow is evident in the higher NDVI values. In contrast, in areas of western Wyoming and central Colorado where snow cover is greater, low NDVI values are seen. Figure 8. The U.S. comparison to last year at this time for the period April 1 – 14 from K-State’s Ecology and Agriculture Spatial Analysis Laboratory shows that the greatest increase in biomass activity is in the northern Plains and the Pacific Northwest. This is due primarily to decreased snow cover this year. For example, Itasca, ND reported no snow on the ground on the 13th of April this year. Last year, it reported 13 inches on the ground. Figure 9. 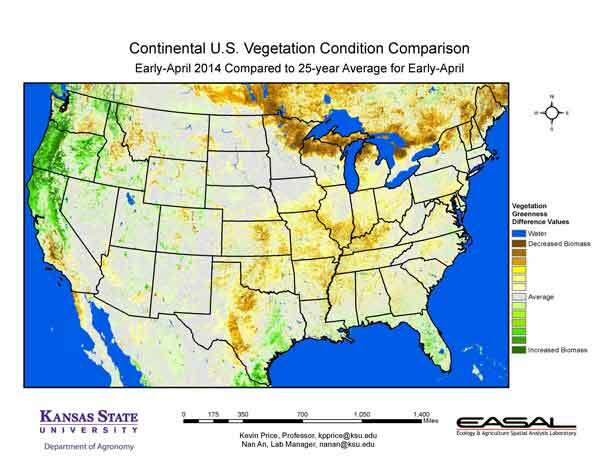 The U.S. comparison to the 25-year average for the period April 1 – 14 from K-State’s Ecology and Agriculture Spatial Analysis Laboratory shows that the contrast of winters continues to be visible in the northern parts of the country, with delayed vegetative activity in the east, and reduced snow cover in the west. In Texas, the contrast of areas that have had moisture versus those that haven’t is evident. Coriscana, southeast of Dallas, has seen 0.83 inches in April; Abilene, southwest of Dallas, has seen just 0.26 inches.